A partition is an area of hard disk which is reserved for the operating system to use to store data. Each disk can have one or more partitions and a partition can exist on one or more disks. 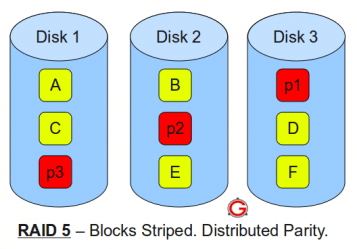 This post is aimed at differentiating between partition types. Since any other volume type defined below will need more than one dynamic disk, you can only create simple volumes if you have one dynamic disk. The system or boot partitions cannot be included in a spanned volume. A Striped Volume is similar to a spanned one in the sense that it can exist on more than one disk, however, the main advantage of Striped volumes is that it improves disk input/output (I/O) performance by distributing I/O requests across disks meaning if you have disk 1 reads at 50 megabytes/sec and disk 2 reads at 40 megabytes/sec, the operating system will be able to read from that partition at a maximum of 90 megabytes/sec. It has no fault tolerance. If one of the disks containing a striped volume fails, the entire volume fails, and all data on the striped volume becomes inaccessible. The reliability for the striped volume is less than the least reliable disk in the set. A mirrored volume is a fault-tolerant volume that provides a copy of a volume on another disk. 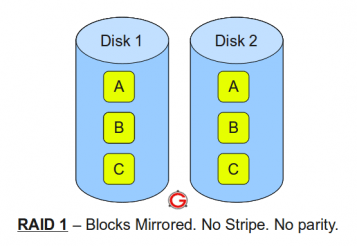 If you want redundancy and protect your data from lost due to bad disks, then you should create a mirrored volume since it duplicates the data in the volume onto another disk. 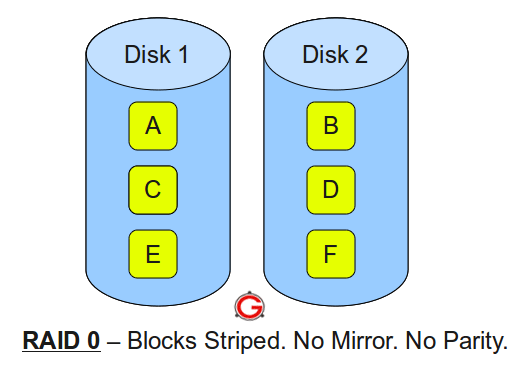 Each copy of your volume is known as a mirror and each mirror is always located on a different disk. If one of the disks fails, the data on the failed disk becomes unavailable, but the system continues to operate by using the unaffected disk. A RAID-5 volume is a fault-tolerant volume that stripes data and parity across three or more disks. Parity is a calculated value that is used to reconstruct data if one disk fails. When a disk fails, Windows Server 2003 continues to operate by recreating the data that was on the failed disk from the remaining data and parity. Good performance ( as blocks are striped like in striped volumes). Best cost effective option providing both performance and redundancy. That give you an idea of the different volume types, as well as, the advantages and disadvantages of each one. If you have any problems, questions, or concerns please leave a comment below. You can also follow me on Twitter, add me to your circle on Google+, or like my Facebook page to keep yourself updated on all the latest of Hardware and Software reviews. This entry was posted in Software, Technology, Windows and tagged benefits, drawbacks, FAT, FAT32, fault tolerance, hard disk, mirrored, NTFS, parity, partition, performance, raid-5, redundancy, spanned, striped, Windows 7. Bookmark the permalink. Thank you, Timour! I purchased a used hard drive and docking station as a back-up system, and your post helped me to understand why I’d choose “simple volume” from the format choices in Disk Management. Are there advantages to multiple partitions on one back-up drive? If so, how would you create that? – Separate partitions for backups of different systems: For example if you have two PCs, you could keep the backups for the first one in partition A and the ones for the second PC in partition B. – Organizing your data is easier: this point includes the first one with the addition of having a partition for just your documents, pictures, music, and videos and another partition for games or other needs. – Improved performance: hard disks usually work better on small chunks of data rather than one big partition since there is less re-position of the read head when accessing files under a smaller partition. – Formatting Convenience: If you ever need to format, you do not have to copy your data out first since it resides on another partition. You can just format the OS partition. Thank you for the info. Which partition type would you recommend if you are just restoring a USB Memory Bar Device?